This fifteen-unit course deals with the many situations in which hotel employees meet guests, including reception, restaurant and bar work, answering the phone, giving directions, dealing with guests' problems, writing short e-mails and letters, suggesting places to visit and explaining how things work.  Deals with all situations where hotel employees meet guests, from the front desk to the restaurant.  Short, easy-to-use units that focus on improving fluency, accuracy and vocabulary.  Strong emphasis on pronunciation.  Suitable for in- and pre-service students. 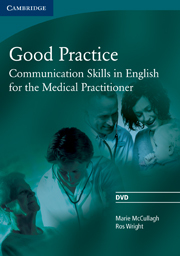 Good Practice is a course for doctors and medical students who need to communicate with patients in English; the course can be used in the classroom or for self-study.